Much has been made of the relative value of pass-rushing ability in the NFL, as we’ve discussed multiple times on the PFF Forecast (this episode in particular). The simple fact that a strong pass-rush directly impacts the most valuable play in football, the downfield pass, makes it a very precious commodity. 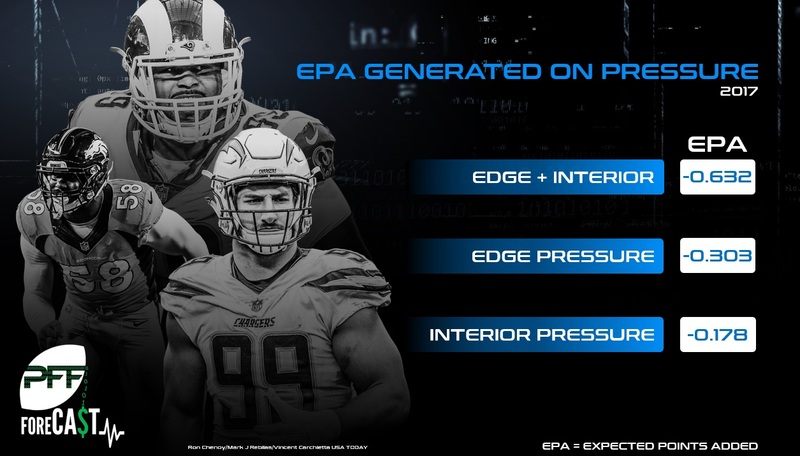 Regardless of where you rank pass-rushing among the different facets, there remains the question of whether pressure is more valuable when it is generated from the interior or the edge. The traditional perception that interior defensive lineman are simply run-stuffers while edge defenders are responsible for creating pressure has gone the way of the printed map with NFL teams figuring out that passing reigns supreme. Players like Aaron Donald (99.7 PFF grade and 99.9 pass-rush grade), Fletcher Cox (90.3 pass-rush grade) and Geno Atkins (89.3 pass-rush grade) have generated tremendous value because they lay waste to would-be pass blockers and cause a nightmare for the opposing quarterback. 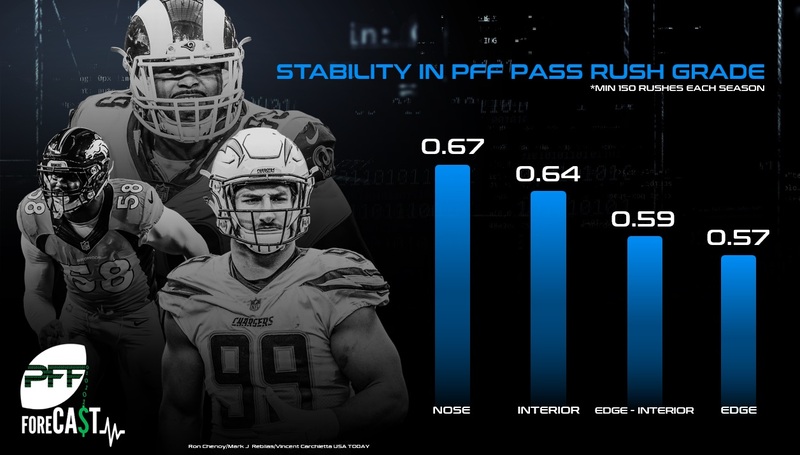 Just because the interior d-linemen of today are making a name for themselves as pass-rushers doesn’t necessarily mean that the pressures they generate are more valuable or even as valuable as those generated by their counterparts on the edge. In fact, the surfeit of pass-rush production still resides on the edge; in 2017, there were two interior linemen with a pass-rush grade over 90.0 and 10 with a pass-rush grade of 80.0-plus, meanwhile six edge rushers earned a 90.0-plus pass-rush grade and 19 hit 85.0 or above. Another argument that has gained some traction is that the reliance on quick throws in the current iteration of the NFL makes dominance on the interior and players like Donald (though he is really without compare) even more valuable. From 2011 through 2013 the average time to throw was 2.77 seconds compared to 2.67 seconds over the last four seasons (2.69 seconds in 2017). For this reason, we will focus on 2017 data, though the difference between 2017 and including the last four years is quite small. There are several things to consider when answering the ultimate question — which position creates pressure more frequently, which position creates more value for their team when they create pressure, which position creates pressure quickest, and which position creates pressure at a more consistent rate year after year. One of the first places to look in terms of the value of the pass-rush from the edge versus the interior is how often pressure occurs from these places. Unsurprising (we think) to most observers of football, pressure is still most-frequently occurring from the edge. Pressure (a sack, hit, or hurry) occurred on 12.02 percent of pass-rush snaps from the edge in 2017, while non-nose tackle pass-rush snaps generated a pressure only 8.22 percent of the time. Pass-rush snaps from a player shading the center occurred at a lower rate than both from the edge and other interior spots (6.43 percent) while someone that rushed the passer from an off-the-ball position (blitzing from linebacker or the slot) generated pressure frequently (16.85 percent of the time). This can be seen within our premium stats for individual players as well. For example, there were 42 qualifying 4-3 defensive ends/3-4 outside linebackers with pass-rush productivities over 10.0 in 2017, while there were only seven qualifying defensive tackles/3-4 defensive ends that eclipsed the same mark. PRP weighs sacks a bit more than hits and hurries, but as we’ll see below, that only points more in the favor of value of edge pressure being higher than interior pressure. The value of pressure is undeniable. Last season, defenses created pressure on 35.5 percent of dropbacks. On plays under pressure, the offense averaged -0.32 expected points added (EPA) per play compared to 0.21 when the quarterback was kept clean. When the quarterback was under pressure, offenses gained 3.8 yards per play compared to 7.2 when clean. Not all pressures are created equal, however. When pressure comes only off the edge the offense averaged -0.303 expected points added per play, only slightly below the overall mean. Pressure that comes only from the interior or the nose position results in an average expected points added per play of -0.178 and -0.213, respectively. Both of those are well below the overall average. In isolation, pressure off the edge provides far more value than pressure from the interior or nose. The most debilitating pressure occurs, unsurprisingly, when multiple positions get to the quarterback. When pressure occurs from both the edge and interior the offense is at a tremendous disadvantage, averaging -0.632 EPA per play. Pressure from the edge and nose is also quite disruptive, causing a loss of 0.482 EPA per play for the offense. Both scenarios are well above the average pressure in terms of generating value for the defense. While it doesn’t occur often, pressure that occurs from the interior and the nose position is not quite as valuable at -0.275 EPA per play for the offense. The most valuable pressures are those that result in sacks or fumbles. Whatever the reason, location of the rush or the speed of the player, the edge rusher has the clear upper hand. Edge rushers had a sack rate of 1.83 percent and a forced fumble rate of 0.28 percent compared to interior defensive lineman (0.97 percent sack rate and 0.07 percent forced fumble rate) and nose tackles (0.79 percent sack rate and 0.06 percent forced fumble rate). One would presume that the quicker the pressure the more it benefits the defense. But that isn’t exactly the case. Perhaps because of the way passing plays develop there is a notable advantage to pressuring the quarterback quickly, but not too quickly, as offenses averaged -0.273 EPA per play on pressures occurring in 2.0 seconds or less and -0.384 EPA per play in between 2.1s and 2.5s (the highest of any time interval). After 2.5s the value of a pressure drops to a loss of 0.271 EPA per play for the offense. In general, pressures that occur in 2.5s or less cost the offense 0.342 EPA per play compared to those that occur in 2.6s or more which costs the offense 0.289 EPA per play. As we all know, the shortest route to the quarterback is a straight line and while there is no explanation in this article of how triangles work the shortest straight line is the one that has the smallest angle relative to the line of scrimmage. Having said that, the interior line is in a position to take a more direct route to the quarterback. So does that translate to quicker pressure? Before diving in, it is important to note that we track the time to pressure with respect to when the quarterback first feels the heat, hence we look again at pressures that occur from each individual position as well as the combinations. The average NFL time to pressure in 2017 was 2.42 seconds. Neither edge nor interior pressures managed to beat the average with edge-only pressures averaging 2.43 seconds and interior-only pressures averaging 2.46 seconds. Unlike value, time to pressure does not take a leap when both the edge and interior pressure occurs (2.45 seconds). While pressure from the edge appears to happen more often and has more value than pressure from the interior, we’ve seen examples within our data where the more valuable trait among two choices is not the more stable one. To see if this may be the case for pass-rushers, we used a clustering algorithm to group players into broad position groups using our PFF player participation data. These players (all of whom had 150 or more pass-rushing snaps in consecutive seasons) fell into four clusters that we’ll use in this analysis: predominantly edge, edge/interior hybrids, predominantly interior, and interior/nose hybrids. We found that the further away from the ball a player plays the less stable his performance in terms of PFF pass-rushing grade and pressure rates. For example, PFF pass-rushing grades are correlated season-to-season at a rate of 0.67, 0.64, 0.59 and 0.57 for interior/nose, interior, edge/interior and edge players, respectively. This is a nontrivial difference in trait maintenance, but likely does not make up for the increase in both frequency and value of edge pressure as it relates to interior pressure. Sack rates were less stable for edge (0.29) than interior (0.34) but forced fumble rates were more stable for edge (0.22) than any other position cluster. So, having an Aaron Donald one season is indeed more likely to lead to having an Aaron Donald the next relative to a similarly strong edge player, but an interior player needs to be like Donald to even make the comparison to a similarly-skilled edge player in the passing game a meaningful one. There have been 95 instances where a player had more than 150 snaps as a predominantly edge player one season and then 150 snaps as an edge/interior player the next. Among that relatively small sample, pass-rush trades still appear to stick. The correlation coefficient for this group with respect to PFF pass-rushing grades was similar for predominantly edge players (0.55). It might be a little early to declare edge pressure definitively superior to interior pressure, but the preponderance of evidence thus far certainly casts great doubt that the counterfactual could be true. On Wednesday’s (6/13) edition of the PFF Forecast we discuss which non-QB/CB each of us would most want on our team, subscribe and download to see who got the question right.